Exacting the maximum from frequent flyer programs, with the aim of minimal cost, premium holidays. AT LAST , THE BEST WAY TO TAKE OUT THE PLATINUM CARD IS BACK ! For at least 3 years, American Express ran an upgrade offer, offering 20,000 MR points if you upgraded from their gold card to their platinum card. However around the end of Oct 2016, the offer webpage disappeared. Various reports indicated that if you phoned you may or may not get 10K or 20K points for upgrading, but it certainly wasn't guaranteed. If you are into collecting miles, then you'll know that American Express membership reward points are a central plank for any serious miles/points collector. Amex cards provide a good earning ratio, and also the points accrued can be converted into many different hotel/airline loyalty programs, which gives pretty good immunity from a points devaluation. Additionally, American express or their partners, occasionally run transfer bonuses, which can get you anything up to 50% more "bang for your buck". The top end card in the Amex portfolio is the Platinum card. If someone refers you, this gives you 35,000 bonus Membership Reward points when you spend £2000 in the first 3 months. Including the points you get for the spend, that means you end up with 37,000 MR points. This card has a hefty £450 a year fee, which I agree is a daunting outlay. However, there is a little known way of getting 45K bonus points, which to my knowledge hasn't been fully detailed on any other UK blog. There is no fee for taking out the gold card. If you get referred (and I'd appreciate the opportunity to refer you), you will get 22,000 MR points when you spend £2000 in the first 3 months. To apply for the card, just click the gold card above, or the one to the right of this article. Once you've done that spend, and the points are in your account, you apply to UPGRADE to the platinum card, using this link. This will cost the usual £450, and you will end up with the same card and benefits as if you signed-up for the card directly. However, as a thank you for the upgrade, American Express will give you a further 20K points when you spend £1000 on your new platinum card. So that's 22K referral bonus on the gold card, 2K for doing the £2000 of spend on it, 20K for upgrading to the platinum card, and 1K for the £1000 of spend required to activate the platinum upgrade bonus, a total of 45K for £3000 of spend. Compare that to the 38K points that you would get if you did £3000 of spend on the platinum card directly, and you'll see you are 7000 MR points better off. Note also, that the gold card comes with 2 VIP passes to airport lounges. Although the platinum card comes with priority pass, these VIP passes can be used to bring 2 extra guests into the lounges. I'd value them at £30-£40. Why is this smarter way not widely reported ? Likely as not it's because a gold card referral doesn't pay as much as a plat card referral, and so they prefer their readers to take out a platinum card instead of a gold card. What's the downside of doing this ? It requires a little bit more work, than just applying for the plat directly. Much appreciated, and I'm glad you found the article useful. Hi! The link doesn't seem to be working? Any ideas? ANy update on this link? At the moment, there is no link available to do the upgrade. I have seen reports that if you have the gold card and phone amex looking to upgrade, they will offer you points for doing so. 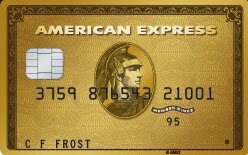 American Express GOLD CARD fee free for the 1st year. Simply spend £2000 in the first 3 months and they'll give you 22K MR Points (=22K BA miles). Get updates to this blog via email ! If you haver a question pertaining to anything in my blog, or need extra help with applying for the Amex Platinum card an Amex BA premium referral, please feel free to email me.